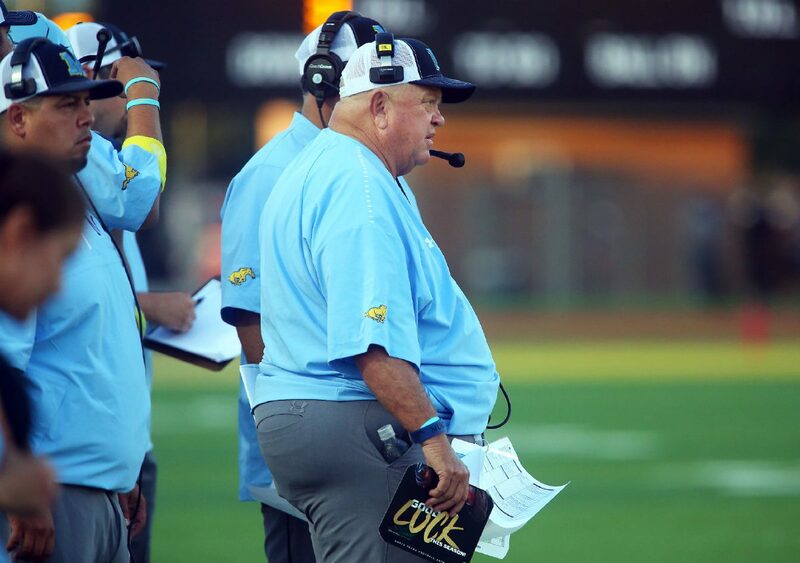 McAllen Memorial head football coach Bill Littleton watches the action on the field in a District 30-6A opener against Mission High at McAllen Veterans Memorial Stadium on Thursday, Sept. 27, 2018, in McAllen. McALLEN — With 2:18 left in the game, a Mission High field goal sailed through the uprights. The lead became 10 for the Eagles, who were 138 ticks away from handing McAllen Memorial its first district loss since Oct. 25, 2013. 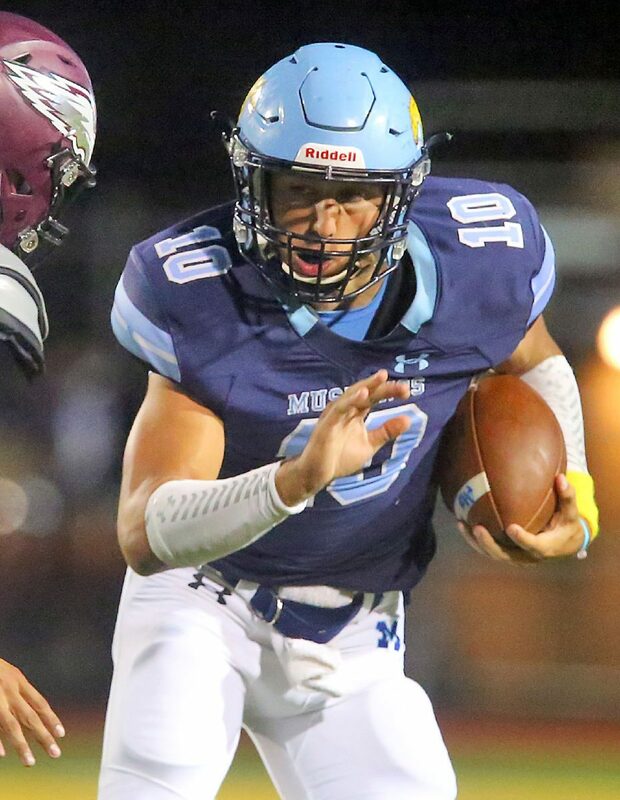 Even though the Mustangs trailed by 21 at one point, 14 at the half and 10 in the final minutes, McAllen Memorial wouldn’t be denied a 27th straight district win, emerging victorious 42-38 on Thursday night at McAllen Veterans Memorial Stadium in the Monitor’s Game of the Week. 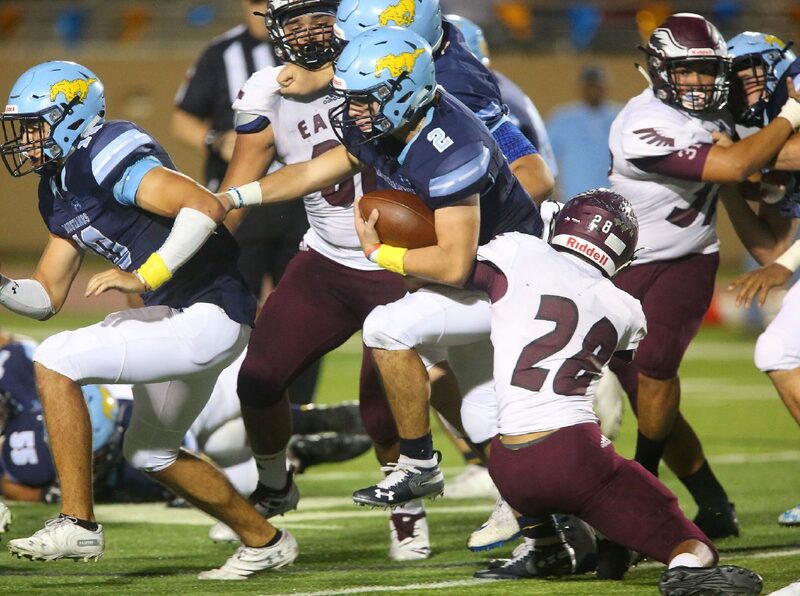 McAllen Memorial quarterback Sean Skaugen (10) carries the ball in a District 30-6A opener against Mission High at McAllen Veterans Memorial Stadium on Thursday, Sept. 27, 2018, in McAllen. 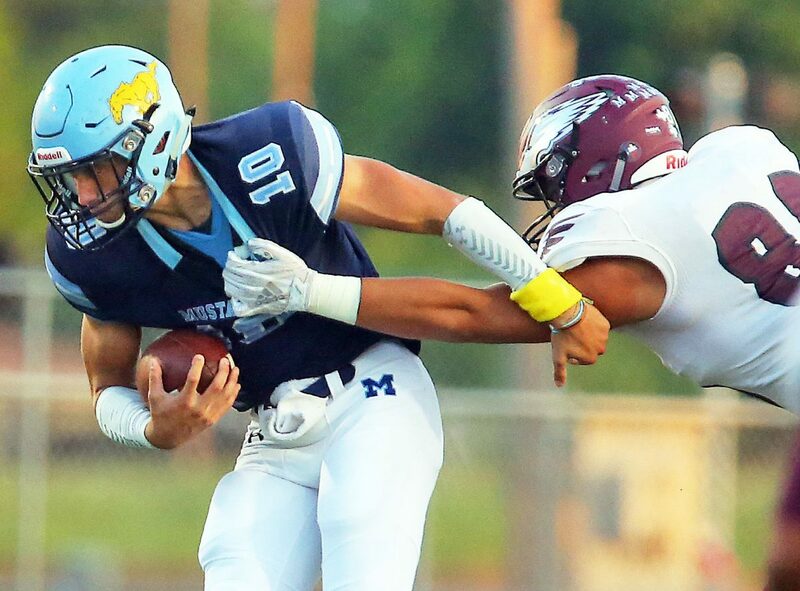 McAllen Memorial's AJ Castro carries the ball in a District 30-6A opener at McAllen Veterans Memorial Stadium on Thursday, Sept. 27, 2018, in McAllen. 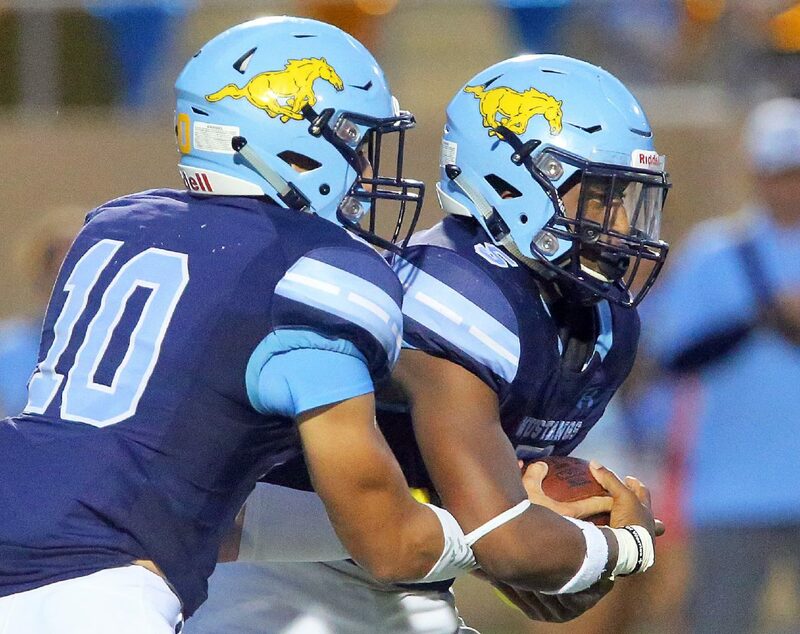 McAllen Memorial quarterback Sean Skaugen (10) hands off the ball to Campbell Speights (5) in a District 30-6A opener against Mission High at McAllen Veterans Memorial Stadium on Thursday, Sept. 27, 2018, in McAllen. Mission High wide receiver Sebastian Gonzalez (11) and McAllen Memorial's Diego Villarreal (6) fail to catch a pass intended for Gonzalez in a District 30-6A opener at McAllen Veterans Memorial Stadium on Thursday, Sept. 27, 2018, in McAllen. 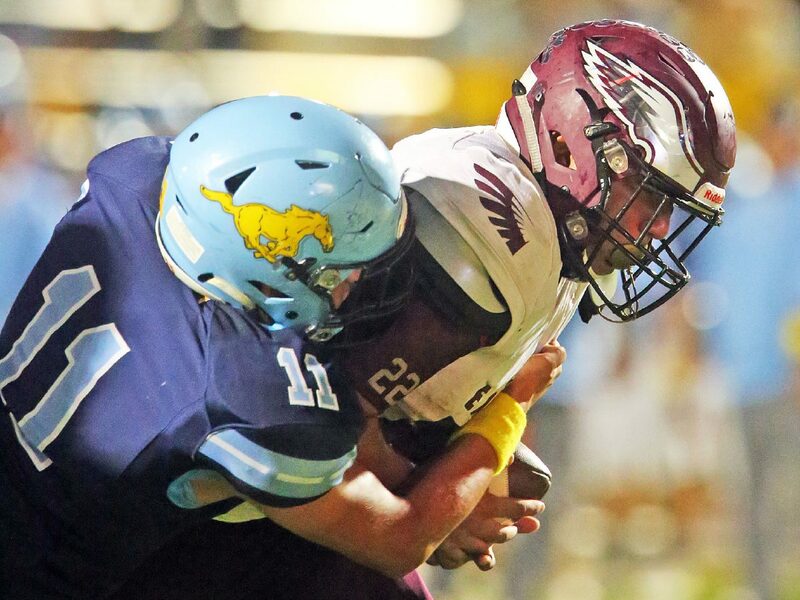 McAllen Memorial quarterback Sean Skaugen (10) tries to break free of Mission High defensive player Reymundo Garcia (88) in a District 30-6A opener at McAllen Veterans Memorial Stadium on Thursday, Sept. 27, 2018, in McAllen. 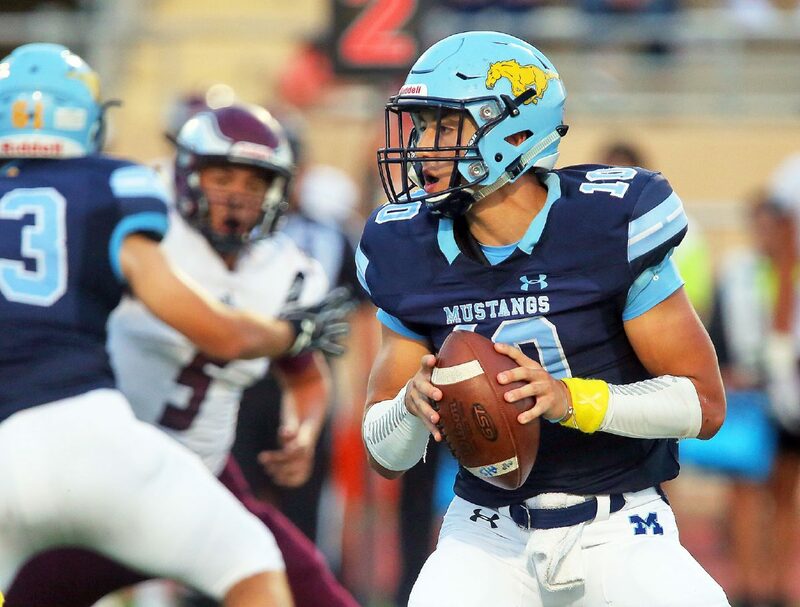 McAllen Memorial quarterback Sean Skaugen (10) looks to pass in a District 30-6A opener against Mission High at McAllen Veterans Memorial Stadium on Thursday, Sept. 27, 2018, in McAllen. Mission High running back Andrew Maldonado (22) fights against McAllen Memorial's Joseph Lara (11) as he carries the ball in a District 30-6A opener at McAllen Veterans Memorial Stadium on Thursday, Sept. 27, 2018, in McAllen. McAllen Memorial's Campbell Speights carries the ball in a District 30-6A opener against Mission High at McAllen Veterans Memorial Stadium on Thursday, Sept. 27, 2018, in McAllen. Mission High running back Andrew Maldonado (22) tries to move past McAllen Memorial's Justin Chairez (1) in a District 30-6A opener at McAllen Veterans Memorial Stadium on Thursday, Sept. 27, 2018, in McAllen. The comeback started with a trick play. 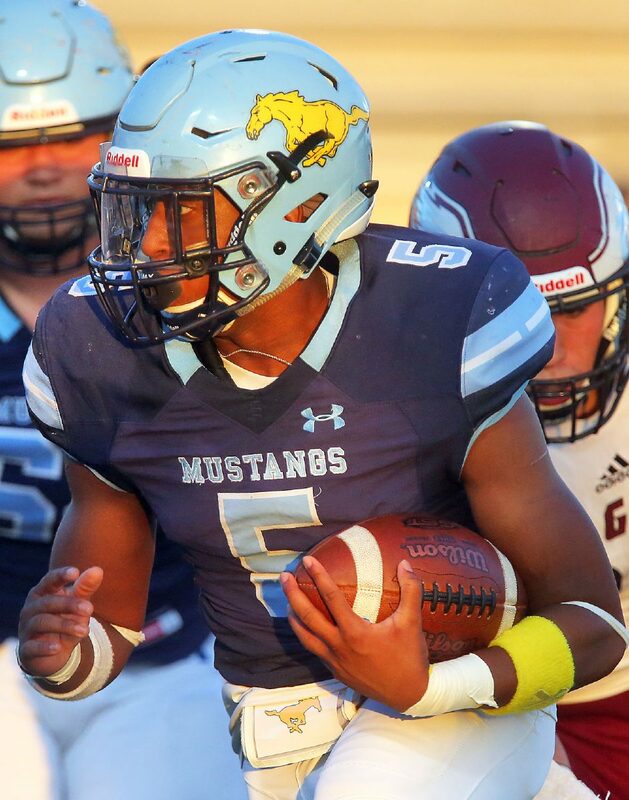 A wide receiver pass from Zyan Gregory to senior receiver Ethan Bazan went for 37 yards, and the Mustangs were in business. Speights nearly recorded a completion of his own, but instead, a Mission defender was called for a pass interference. Bazan caught his second TD of the night one pass later to cut the lead to three with 1:37 remaining. 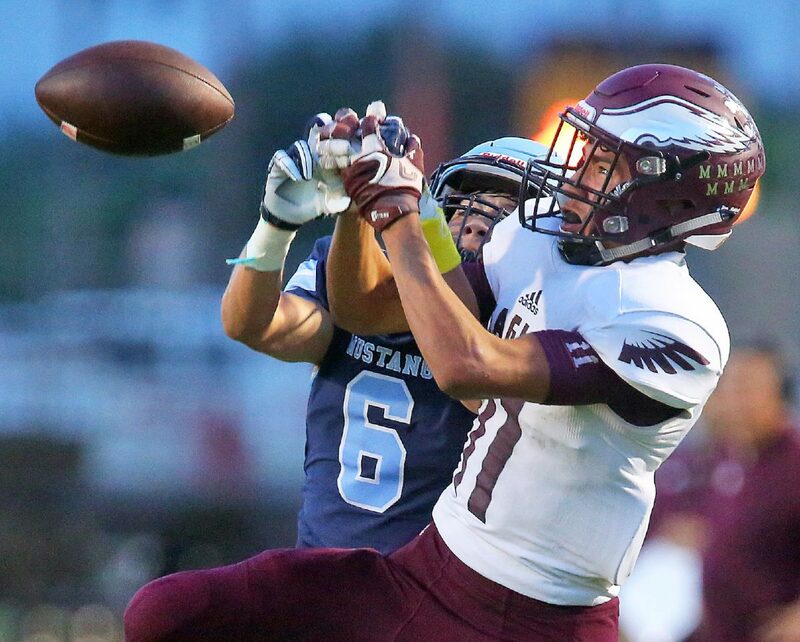 In the game’s biggest moment, Memorial kicker Alex Cardenas kicked and recovered his own onside attempt to give the Mustangs possession one more time. The ball was picked up dangerously close to 10-yard mark necessary for the kicking team to be eligible to fight for the ball. Sean Skaugen scrambled for 47 yards to put the ball at the 3-yard line. With 46 seconds left, Speights was high-stepping his way into the promised land and giving his squad its first lead. Mission High was excellent for many moments and in many phases of the game. Freshman Jeremy Duran started at quarterback and tossed a TD pass to Andrew Maldonado. After that, Damian Gomez was back under center and was a difference-maker. He threw a touchdown pass and ran for another two. The Eagles defense was strong for most of the first half. Mission forced Memorial to punt on three of its first four drives and picked off a pass. They would have taken a three-touchdown lead into the break if not for a penalty-plagued defensive drive prior to the break that let Memorial cut the deficit to 14. Bazan had 169 receiving yards and two touchdowns in the win. He also had 127 yards and a score against Vela in Memorial’s last outing. Skaugen led his team in rushing with 129 yards, including a 61-yard touchdown run to tie the game at 28 early in the fourth. 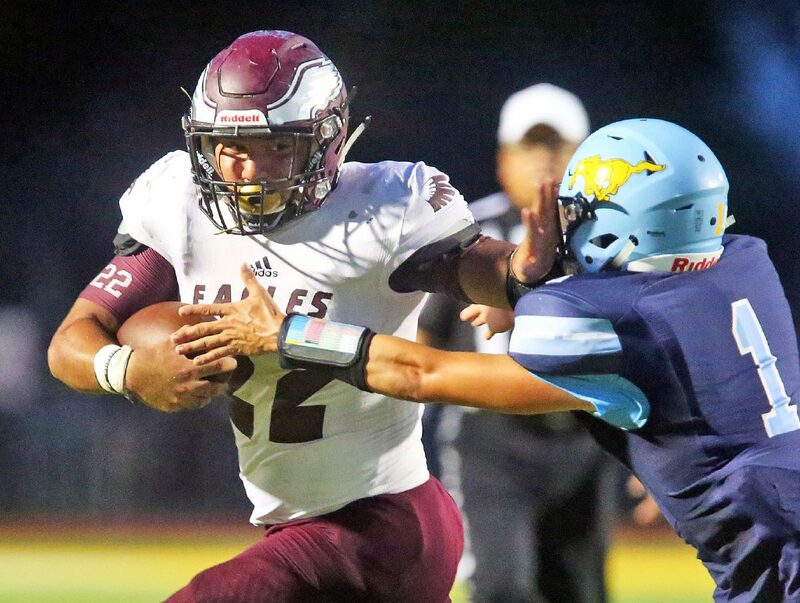 Mission’s Maldonado had the lone rushing score from a running back, but Tito Moronta led the Eagles with 123 rushing yards. Both players pitched in on defense. Moronta even had a sack. Even after a strong effort, the Eagles won’t remember this instant classic too fondly.